Material : PVC. Dimensions : 80mm*80mm. Glowing LED light with 7 different color changing. Support 12-hour and 24-hour time format, calendar, temperature and alarm. (not include battery). 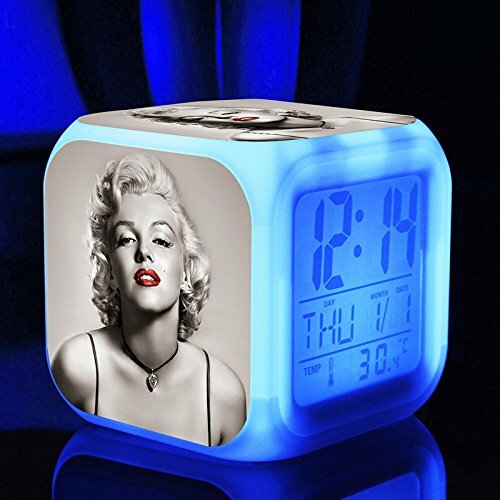 Alarm Clock LED light Worked by 4 x AAA batteries or DC2.5 Adapter (WE PROVIDE A CABLE - ADAPTER NOT INCLUDED - PURCHASE SEPARATELY) ; LCD screen powered by 2x AG13 batteries (INCLUDED). Package includes : 1 pcs clock, 2 button batteries, 1 cable without adaptor, manual, and single box packaging.